No time to rant today. I did take time to view this debate moderated by Mark Styne between Howard Dean and Fred Thompson. The debate took place at the University of Calgary! I’d like to be proven wrong if I say none of you Cowgarians attended. I vaguely remember some lunatic lefty I met through Lindsay Brown all steamed up about Marxist politics way back in the ’60’s; can’t remember his name. Trying to convince me that all the wealth I saw around me was ill gotten, and the only way to level the playing field was bloody revolution. I was into playing hockey and dropping out of university (I’ll leave out the negatives). We didn’t see eye to eye. If I remember correctly, he died young. Mid terms are mostly settled. Lots of red meat for pundits and citizens alike…..
Amen. 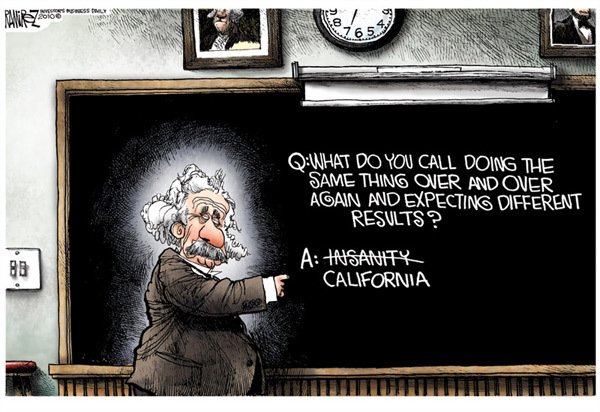 Any predictions on the time-to-collapse of the “Golden State”? 2 years seems to be (after much surfing of the Intertubes) an accurate estimate. For those (like me) who wistfully dream that Charles Bronson in “Death Wish” was de rigueur in our culture, yesterday’s “message” to the Munificent Mulatto® wasn’t loud enough, painful enough, or pointed enough…… My proof? Listen to what the fool says today in his statement.